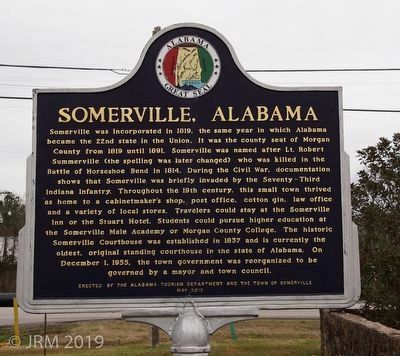 Somerville was incorporated in 1819, the same year in which Alabama became the 22nd state in the Union. It was the county seat of Morgan County from 1819 until 1891. Somerville was named after Lt. Robert Summerville (the spelling was later changed) who was killed in the Battle of Horseshoe Bend in 1814. During the Civil War, documentation shows that Somerville was briefly invaded by the Seventy-Third Indiana Infantry. 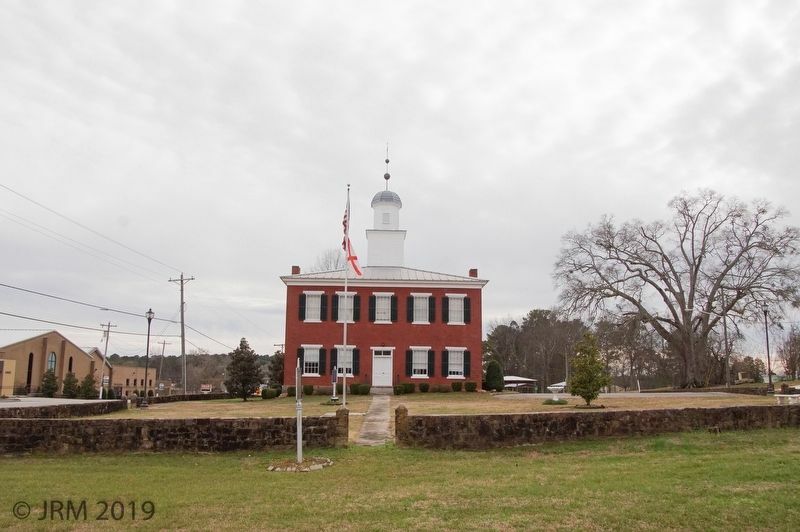 Throughout the 19th century, the small town thrived as home to a cabinetmaker's shop, post office, cotton gin, law office and a variety of local stores. Travelers could stay at the Somerville Inn or the Stuart Hotel. Students could pursue higher education at the Somerville Male Academy or Morgan County College. The historic Somerville Courthouse was established in 1837 and is currently the oldest, original standing courthouse in the state of Alabama. On December 1, 1955, the town government was reorganized to be governed by a mayor and town council. Erected 2010 by Alabama Tourism Department and the Town of Somerville. 2. Somerville Courthouse Square, looking south. The subject marker can be seen (if you look closely) to the left of the gateway, in the front of the stone wall. The "First Permanent Courthouse" marker can be seen (if you look closer) nearer the courthouse. Unfortunately, both markers face east-west and can only be seen here in side profile. 28.398′ N, 86° 47.901′ W. Marker is in Somerville, Alabama, in Morgan County. Marker is at the intersection of Broad Street and Main Street, on the right when traveling east on Broad Street. Touch for map. Located north of the historic Somerville Courthouse. Marker is in this post office area: Somerville AL 35670, United States of America. Touch for directions. Other nearby markers. At least 8 other markers are within 12 miles of this marker, measured as the crow flies. First Permanent Court House, Morgan County (within shouting distance of this marker); Valhermoso Springs (approx. 7.3 miles away); City of Hartselle, Alabama / Hartselle Facts (approx. 8 miles away); Triana, Alabama (approx. 8.4 miles away); Our History (approx. 10.1 miles away); Skirmish at Woodall's Bridge (approx. 10.8 miles away); Mt. Zion Primitive Baptist Church (approx. 11.3 miles away); Mooresville Brick Church/The Cumberland Presbyterian Church (approx. 11.6 miles away). More. Search the internet for Somerville, Alabama. Credits. This page was last revised on February 28, 2019. This page originally submitted on February 28, 2019, by Lugnuts of Germantown, Wisconsin. This page has been viewed 71 times since then. Photos: 1, 2. submitted on February 28, 2019, by Lugnuts of Germantown, Wisconsin. • Bernard Fisher was the editor who published this page.